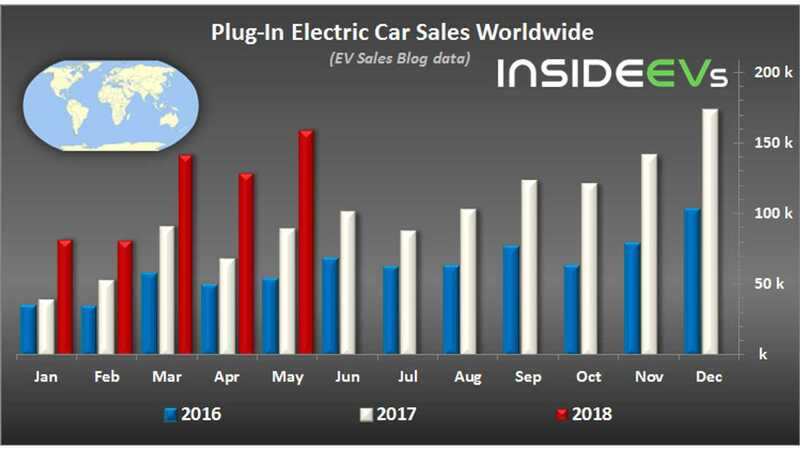 Globally, plug-in electric car sales in May exceeded 159,000, which is second best result ever. A new all-time record is now expected in June. The 159,346 deliveries reported for May translates into an outstanding growth rate of 75% year-over-year. 63% of sales came from BEVs, compared to 37% for PHEVs. See more our sales reports for May 2018 here. After the first five months of 2018. sales almost hit 600,000 (estimated 597,757, up 71%) at an average 1.5% market share. The BAIC EC-Series, thanks to 12,624 sales in May, managed to move back into first place in the YTD rank with nearly 40,000 deliveries. With such a strong contender in China, the second-generation Nissan LEAF (7,069) was left behind at #2. 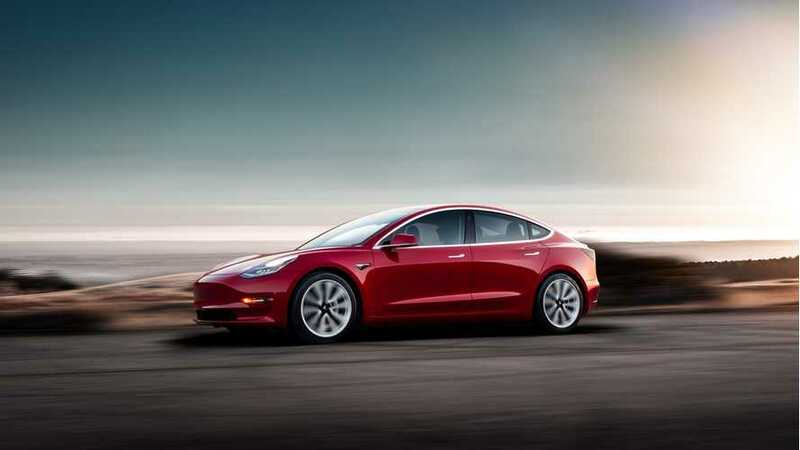 The Tesla Model 3, with an estimated 6,551 deliveries, was third best for the month and fourth for the year (up 5 positions). 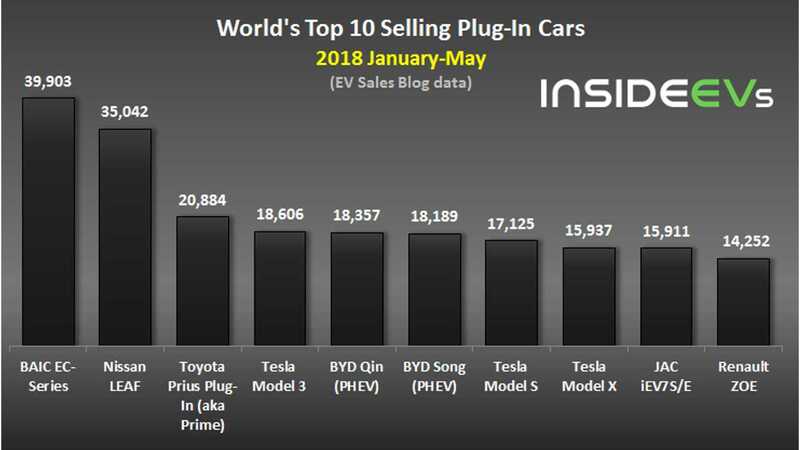 Tesla remains the only manufacturer to put three models in the top 10. The race between manufacturers of plug-in cars becomes closer than ever before. BYD, Tesla and BAIC are now spread by just a few thousand and each is hoping for the win. Especially BAIC, who surges up to an all-time high of almost 20,000 in a single month. 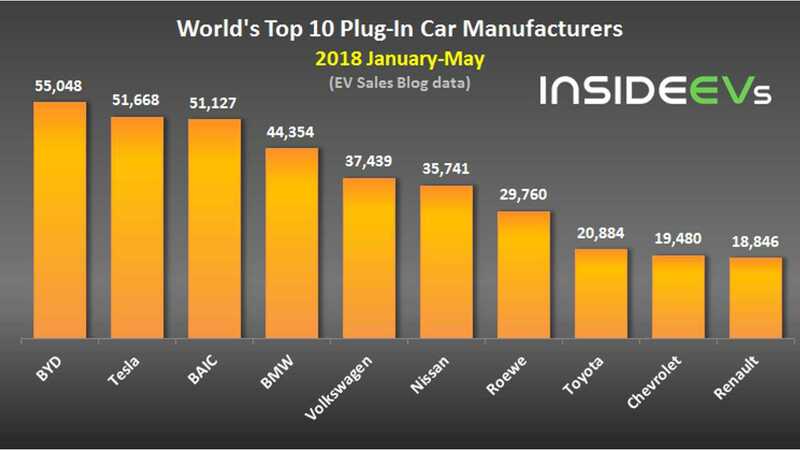 Interesting things are happening in lower part of the table, as Volkswagen (9,743 in May) is now above Nissan (7,123) and Chevrolet returned to the Top 10.